* Total number of reviews and star-ratings are based on data collected during the time period May Heating & Air Conditioning has been using the ReviewBuzz system and may not directly match the data found on each public review site. May Heating & Air Conditioning did an excellent job of servicing my faulty furnace that stopped running on the first coldest day of the winter season right before Thanksgiving! They were prompt, friendly, and available when needed. Best part they're local, and family owned/operated. I recommend them to anyone in my neighborhood. They came to my house twice that day, and even followed up the next day with a phone call to ensure everything was running smoothly. Alex was very educated, welcoming and easy to talk with. He explained the basics of the furnace and troubleshooting. Amazing fast and easy furnace install within a couple of days from our estimate we had our new furnace installed. Thanks to each one of them. Wonderful company! I was having issues with allergies in my home and thought the culprit may be my furnace and/or ducts. 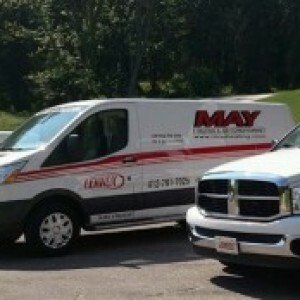 May Heating and Air Conditioning made their visit to my home a priority since I was having health issues. They were very thorough in their inspection and took the time to check the furnace, ducts, vents, cold air returns, etc. They also took care of and cleaned any and all possible problems that they found. I'm very grateful! I was very pleased with the entire team at May Heating, from the estimate/quote process all the way thru the installation. Bob and Alex were very cordial and timely in responding to my request for an estimate and then providing the quote. Scheduling the installation around my busy schedule was made easy by Alex. The 2-day installation went very well, and Quentin and Andy did a great job with everything from explaining what they were doing to the cleanup afterwards. Both were very professional and it is easy to tell that they take great pride in their work. Looking forward to the A/C installation in the Spring! Very friendly and knowledgeable staff. Provided a great deal of detail around options and install was smooth. Would certainly recommend this company to anyone in the market for repairs or a new heating/AC system. My furnace went out during one of the recent cold snaps. One of the local heating co.'s could come out in 4 days, but May Heating came that same day,and had a new furnace the next day. BUT, they came across an unexpected problem during installation (the house wasn't grounded properly and caused a small short circuit fire, which was quickly put out!). They calmly assessed the situation, called in an electrician to properly ground the switch box and finished the installation. No extra charges for the extra time they had to put in. They're a family run business who are friendly and do good work, and can overcome unexpected problems! May Heating and Air Conditioning did an excellent job. Quentin product knowledge and skills were outstanding. I would highly recommend May Heating for all your needs. This is a 3 generation family that performs at an excellent level. FANTASTIC! They came within an hour of calling and had my furnace back up and running in ~30 minutes. They were very professional and seemed very knowledgeable. I will continue to use May for all of my heating & cooling needs. Pricing was very fair as well. Robert May and his two sons, Quentin and Alex did an outstanding job selling and replacing my house furnace. The price quoted was fair and the project came in at what they quoted. Altogether they were in and out in one day. The process was very orderly. The work space was cleaner when they left than it was before they started! Every step of the process was thoroughly explained to me before they started. During the planning phase I was given several options and the sales process was handled in a consultive fashion with no pressure. I had a great experience and I would gladly use them in the future. D.G. 11/7 we went to bed the furnace was working, we got up (11/8) it was still working but not as good, I got home 3hrs. later it was blowing cold air, and of course, no matter what I tried, it kept blowing cold air. I started calling furnace repair companies and one told me that the age of the furnace was propably the problem (17yrs. old) but he did not work on "RUDD" furnaces, so kept calling and got the receptionist at one company that said maybe next Thursday (11/16) I said I don't have any heat, didn't make any difference. I looked on the "BBB" to see what they had listed for contractors and what was said about them. "May Heating & Cooling" and to boot, they were very close to me. I called and got Alex who is the owner or part owner and explanned my problem to him. He said that he would not be able to get out until the next morning (11/9) due to how busy he was and he was not promising anything, I said fine, see you in the morning. His son Quentin came out along with a trainee, I explained what was going on and within minutes he had the broken part out of the furnace. He went to see if they had the part on the truck which they did not, he called his dad and told him what he needed. Alex told him that he had a man going down to their supplier for parts and he would have him pick up the part. I was informed all of this and he also said there would be another guy coming out later on to install it. That was maybe a total of 35mins. About 4:15Pm. Alex and his father show up with the new part to be installed. Both of them installed the part and they also apologized for it taking so long to get the part and then installing it. Put the furnace on and then that beautiful red glare lit up and out came that wonderful heat. I kept thanking them for helping so fast with my problem. My wife hands me a blank check to pay for the service/repair and they both told me not to worry about it, they would bill me. I have never in 39 years ever have a company perform "any type" of repairs on or in my house without wanting their money right there on the spot after their work was finished. I have never had a service company come into my house and not try to find other things wrong. I have never had any service company come into my house and be quick and effiecient and not try to "milk" the process. This company is great and trust worthy, it seems that it starts from the top and works down. I would recomend this company to anyone and everyone. Thank you for being honest, that's a hard thing to find now a days. 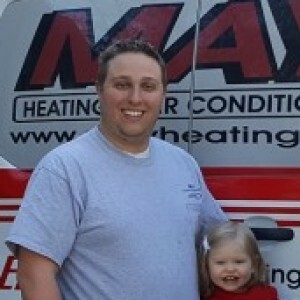 Tom M.
Great service and very knowledge with the heating needs of my house. Made very reasonable recommendation for things in the future and things to keep my eye out for. Great service and very knowledgeable with the heating needs of my house. Made very reasonable recommendation for the future and will defiantly be calling them again. I can't say enough nice things about May Heating & Air Conditioning! From the beginning Alex was so accommodating. Alex and Bob arranged a time to visit my home that fit with our crazy schedule. They looked over and explained everything to me in user friendly terms. Alex and Quentin did our install, and their service was top notch! When I got home the only evidence of their presence was my brand new furnace! Everything was neat and clean. I would definitely recommend them! Excellent service. They were prompt and explained all that they did in servicing my furnace & checking the air conditioner. Highly recommend them! Alex is super nice and helpful on choosing AC unit. The May team did an excellent job on installation. I give them a call next time I have any issues with my furnace (not expecting any problem with the AC they installed)! I had an exceptional experience with May Heating and Air Conditioning. Genuine, efficient and talented, The May family did nothing but impress and I will continue to use and recommend their services moving forward. Couldn't have asked for a better outcome on their installation of my new ductless system! Thank you very much for all your help, you guys were great! Very nice, helpful and knowledgeable. Able to get an appt quickly and got our A.C. back up and running. May Heating & Air Conditioning Team . Customer service is always a top priority at May Heating & Air Conditioning. Our BBB Membership A+ rating is like a badge of honor as we continuously strive to provide the best experience for our clients. Quent joined May Heating & Air Conditioning in 2004 after serving in the U.S. Navy. 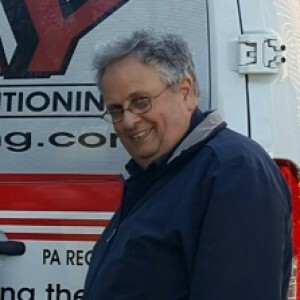 He trained with Bob May and has taken over as the lead installer and service technician for May Heating & Air Conditioning. Quent is married and has three children with his wife. They live in Pine Township. Installed a new AC unit and did it without any problems. Quick, clean, friendly and quality work. I highly recommend May Heating & Cooling for your next project!